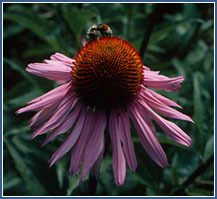 The Centers for Disease Control reports that Echinacea is the third mostcommonly used herbal medicine in the US. This botanical is typically employed for treatment of upper respiratory infections, which afflict adults 2-4 times per year, and cost over $10 billion in annual medical costs. SeveralEchinacea preparations and constituents thereof have demonstrated the ability to suppress inflammation, and may, therefore, be indicated in treating the symptoms of upper respiratory infections. However, while Echinacea demonstrated promise for this purpose in some early trials, a number of recent clinical trials have shown certain Echinacea extracts to be ineffective for treatment of upper respiratory infections. These conflicting findings may be explained at least in part by lack of understanding of the active constituents and mechanisms of action for Echinaceapreparations. Our group focuses on filling these gaps, with particular emphasis on developing Echinacea preparations useful in treating the inflammation associated with infection. One aspect of this project involves identifying active anti-inflammatory constituents from the most commonly used Echinacea species, E. purpurea. In addition, with the help of Dr. Scott Laster at North Carolina State University, we are investigating the mechanisms of action for specific anti-inflammatory constituents against influenza-induced infection. Toward this goal, our research group is engaged in a comprehensive proteomics study investigating the influence of Echinacea extracts and isolated constituents on cultured immune cells. Finally, in collaboration with Dr. Jeanine Davis at North Carolina State University Richard Cech at Horizon Herbs, and farmers across the state of North Carolina, we are investigating the influence of growing conditions on Echinacea’s bioactive constituent profile.